Bezos Divorce: Who Gets Uber Shares? The Bezos divorce is the most expensive ever at $36 billion. While most folks are talking about who gets the Amazon stock and Washington Post newspaper . . . I’ve been wondering about the Uber pre-IPO shares. Go here to join Jeff Bezos – and become an early Uber investor. The Bezos family fortune is currently valued at $137 billion. Yesterday, they announced a divorce settlement. MacKenzie Bezos will get 25% of the couple’s stake in Amazon. Meanwhile, Jeff will keep 75% of the Amazon stock. Plus, he’ll keep complete ownership of the Washington Post and Blue Origin. However, the couple didn’t mention the Uber pre-IPO shares in their announcements. Back in 2011, Bezos invested up to $37 million in the Uber’s Series B financing. Now, we’re not exactly sure how much stock Bezos purchased. Over the last seven years, those Uber shares have surged in value. And by my estimates, they could be worth over $1.4 billion! Now’s your chance to grab Uber pre-IPO shares – at a deeply discounted price. Just click here for early access. 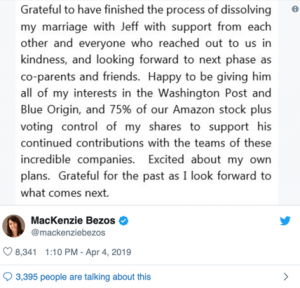 Yesterday, MacKenzie released this Tweet with details on the completion of Bezos divorce. The Bezos divorce deal means that she’ll own 4% of Amazon’s stock. And Jeff will retain 12% ownership of the world’s most valuable company. With $36 billion, MacKenzie will be the world’s fourth-richest woman. And if she negotiates for some of those Uber shares, she could be even richer when the company launches its IPO in late April. Stay tuned! This Uber IPO will be huge. Don’t miss out – click here now.